Primary Activity: Wait for the sun to come out. I'm sure regular readers have noticed how hard I am on people. I can be brutal. But what many readers don't realize is that I reserve my wickedest tongue-lashings for myself. This year I did some incredibly stupid things with my boat, and I haven't the slightest hesitation about describing them, in the hope that someone else will be spared the same ... well ... transcendental stupidity. (notice the bar tying the valves together). During my around-the-world sail twenty years ago, I had a much smaller, older boat, equipped with the old-fashioned diesel fuel system. In that old passive fuel system, if anything interrupted the flow of fuel, even momentarily, the engine might go dry and repriming the system was sometimes a nightmare. One night the fuel system went dry at the worst possible moment — I was trying to escape breaking seas after entering a bay I was too inexperienced — and stupid — to avoid, and I ended up desperately banging a fuel pump with a Crescent wrench as huge waves broke over my little boat, each wave pushing me closer to the rocks. Oh, by the way, I wasn't killed. Just thought you would like to know. Since then diesel engineers have devised a somewhat more complex but far more reliable positive pressure system. 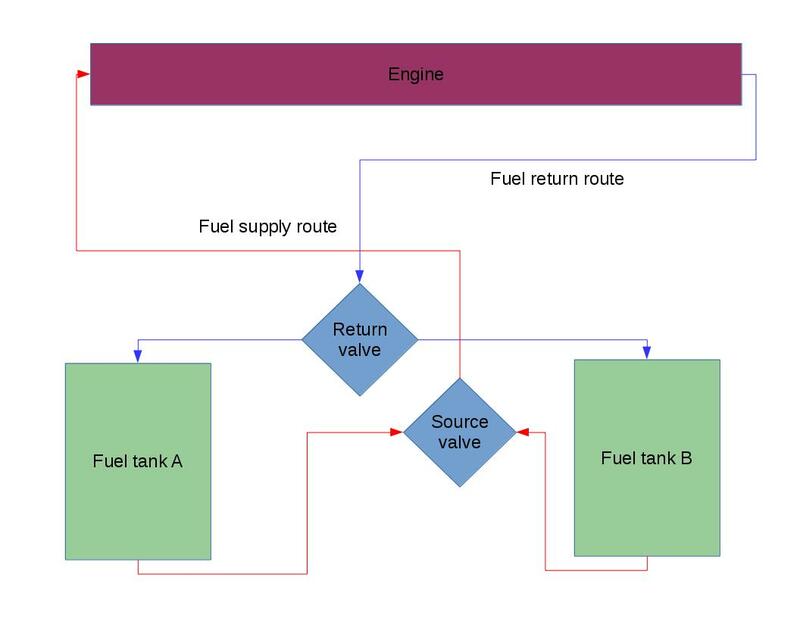 In the new system, one fuel line feeds the engine by way of a pump that keeps the fuel under constant pressure, and another line returns the unused fuel (and any collected air) to the tank. The new system is self-priming, very reliable, and an obvious improvement. But there's a catch. In exchange for the engine not going dry, there are now two fuel valves instead of one, and when you switch tanks, you must always flip both valves. If you don't flip both valves, fuel will be drawn from one tank but be pumped back to the other, and there are particular circumstances where ... something very bad could happen. Since the day I bought this boat, I've known the fuel valves had to be kept in sync, and if not, fuel would be drawn from one tank and flow back to the other, but I didn't think very hard about what that meant. In a vague way I thought all the fuel might end up in one tank. But I overlooked the role of Murphy's Law in all this — that the crossed-valve scenario might happen at the worst possible time. One day I fueled up in Hoonah and started West along Icy Strait, hoping to get past Cape Spencer before nightfall. 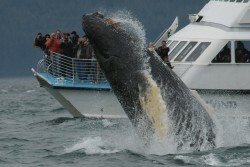 This was the last fueling before Cordova, in Prince William Sound, about 500 miles away. 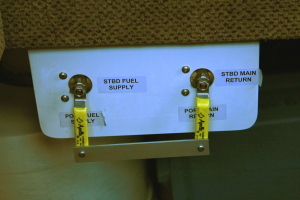 It is during this stretch that I am particularly careful about fuel, because there aren't any intermediate fuel stops. Just as I passed Point Adolphus, the engine quit. As usual it was a windy afternoon and I was pretty close to a rocky coast. I quickly tried to sort out what had happened. I immediately dismissed the idea that I had run out of fuel, since I was only an hour out of Hoonah, where I had fueled up. Then, as the wind blew me toward the rocks, I wasted about twenty minutes trying to figure out what was going on, replacing perfectly good fuel filters and that sort of thing. Finally I looked at the panel with the fuel valves, and I saw they were crossed. I realized I had been in that compartment the previous day putting in a new water pump, and I had apparently bumped one of the valves out of place — but just one of them. Then it came to me. The tanks had been full. Fuel was being drawn from one tank and returned to the other tank, but the return tank was full, consequently the fuel was being pumped overboard until the source tank went dry and the engine quit. In one hour I had completely drained one tank of its fuel. This was the most perfectly stupid moment in my career as a sailor. I had polluted the environment, I had wasted many gallons of fuel at $5/gallon, and I hadn't the slightest idea anything was amiss until the engine quit. At the next opportunity (that evening at anchor) I installed a metal bar that forces the valves to move in synchrony (see picture this page). I recommend this fix to any boat owners who have fuel valves side-by-side as shown. In Cordova a few days later, I described my stupid misadventure to a fisherman I know. He very charitably told me that almost exactly the same thing had happened to him recently, down to the amount of fuel lost, and it is a fairly common occurrence on boats where the two valves are in different locations, making it harder to keep them in sync. I thanked him for telling me his story, but I still felt perfectly stupid. I have a Northern Lights diesel generator on board, 5 kilowatts. This generator has a good reputation, but mine has always been hard to start. I can remember when I first boarded my boat at the dealer's dock, the salesman couldn't start the generator and had to call a diesel mechanic to get it running. Now, in my own defense, it's one thing to fail to notice a change in how something operates, and quite another if it's always been that way. All the time I have owned this boat, the generator has been difficult to start. Sometimes I have cranked the starter so long that the water pump impeller would shred (something they warn you about in the generator instructions), consequently I have laid in a supply of replacement impellers, and I have gotten very efficient at tearing down the generator to replace shredded impellers, a task I would perform several times per season. Hard to start. Always been that way. Must be a design flaw. Similarly brainless thoughts have flowed through the emptier reaches of my brain over the years ... until now. This year I noticed how difficult it is to work on 12 volt systems while alone on the boat, so (as part of another project) I acquired a 12 volt buzzer and attached some wires and clips to it. Now I could put the buzzer in some remote location and hear the buzzer sounding off as I tried replacing fuses elsewhere on the boat. A great time saver. One day I decided to test the buzzer on the generator. Down in the bilge I attached the buzzer leads to the generator's glow plug circuit, then climbed into the pilothouse to start the generator. To my astonishment, the glow plugs were not getting any voltage. It happens that cold glow plugs would make a diesel engine very difficult to start, but the engine would run fine if only you could start it (because then the plugs are kept hot by combustion). I tore the generator down and discovered that the glow plug supply wire had never been connected at the factory — it was rattling around loose inside a control box, out of sight. For seven years I hadn't bothered to analyze this problem, and had replaced any number of pump impellers along the way. I was lucky I hadn't burnt up the starting motor while trying to get around the fact that the generator was, in essence, broken (and easily repaired). How perfectly stupid. This boat has an Espar diesel heater. In my prior boat, an Espar had been installed, but badly, with a reduction in flue size (a very bad idea) to a more convenient diameter for that boat. Mostly because of how it had been installed, it misbehaved and gave me a bad impression of Espar heaters. My present boat came with an Espar heater, a bigger one, installed with adequately sized plumbing. I had high hopes. But after only about 100 hours of operation the new heater gave up the ghost, reminding me of my prior experience. I disassembled the heater and saw that it was severely clogged with carbon, which I managed to remove. I talked about this problem with a lot of boat owners, and most of them claimed very good performance out of their Espars. And since that first repair, I had been getting quite a lot of life out of the heater. My new theory is that, while the boat was tied to the dealer's dock, someone activated the heater during the warm part of the year, then forgot about it. As it happens, this is the worst thing for a diesel heater — in warm weather it never gets very hot and is constantly cycling on and off, which maximizes carbon build-up. A few years ago I wrote a scathing appraisal of this and all diesel heaters, but since then I've talked to a number of people who haven't had any difficulties, and I have seen more reliable performance since the first repair, so I think I was wrong — I now think this heater was abused as a child. I think I'll go back and edit my prior article, or at least qualify its conclusions. The factory alternator on my Cummins diesel is rather modest in its output — something like 105 amperes. But I have a rather huge battery bank, much more than can be provided for by this little alternator, and I've burned up one alternator already, by trying to make it charge my depleted batteries without assistance. This year I decided to try installing a bigger alternator. I chose a 130 amp model, with a kind of universal mounting and universal pulley arrangement as well. The new alternator had several advantages, one of which is that it delivered a higher voltage to the batteries, allowing them to be fully charged while underway, something the stock alternator cannot do. I had the right size pulley installed by someone who owned a sufficiently large wrench, then I installed and tested the new unit. As expected, it delivered exactly the right voltage for the batteries and seemed to produce a lot of current. Everything seemed optimal. A few days later, as I moved my boat to the nearest boatyard to be pressure-washed, I noticed the engine was running hotter than usual. I finished with the yard and set out again, only to see the engine overheat and shut down. As usual, it was a windy afternoon and I was drifting out of control. I dropped my anchor, which eventually caught on something as I approached shallow water. In the meantime, I was desperately trying to figure out what was going on. I quickly saw that the engine belt, responsible for coupling the engine to the alternator and water pump, had shredded and was all in pieces in the engine room. I removed an access cover and saw that the pulley had fallen off the new alternator, thus freeing the belt to self-destruct. I keep belts and a spare alternator on board, which I quickly installed and got underway. I've decided not to try to install any more super-alternators.